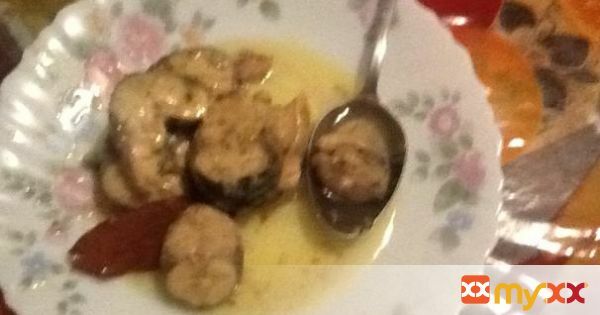 This dish is better than sardines preserves, it contains a lot of important components for a healthy diet. Mackerel is a great source of protein and minerals, such as magnesium (21 percent of daily value), phosphorus (24 percent of daily value) and especially selenium (71 percent of daily value). Remembering all this, you shouldn't also forget that mackerel contains a significant number of calories due to a high protein and fat content. 1. The process is simple: take 4 lbs of mackerel, clean and wash the fish. Cut into mid-sized chunks. 3. Put the fish into the clay saucepan. season the fish and stir it. 4. Add 2 cups of water and sunflower oil. 5. Put the saucepan on a medium heat and simmer for 2 hours. 6. The fish is ready when tender and soft. 7. Herbs: you may add dill or basil before serving the dish. 8. Serve the fish with mashed potatoes and/or steamed veggies.